The creative talents of central Australian art students were celebrated at the opening of an exhibition Sweet-Art at Charles Darwin University’s Alice Springs campus. More than 200 guests were entertained with musical performances and short film presentations at the launch on Monday evening, December 10. Exhibited work included printmaking, drawing, painting, sculpture, digital art and ceramics which remained on display until Sunday, December 16 at CDU’s Desert Lantern Restaurant. Head of School, Creative Arts and Humanities, Professor Donal Fitzpatrick welcomed the guests and spoke of the economic benefits of the cultural industry. “The Australian Bureau of Statistics figures published this year suggest the creative sector as a whole .. is worth more to the economy than manufacturing or agriculture,” he said. Many students presented their works as a means to express their opinions and ideas. Artist and VET student Truce Haynes created a chess board as his interpretation of Australian history. 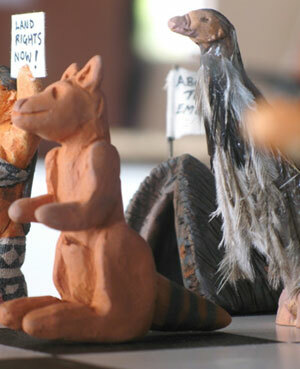 He said the pieces represented different peoples of Australia and covered issues of native title and discrimination. “Once we start playing, the game shows that we are not on different sides, but we are all Australians,” he said. Creative arts co-ordinator and lecturer Suzi Lyon said the evening was a resounding success. “It was great to combine music and multimedia and the event came together to create a really positive environment and the feedback from the audience was excellent,” she said. Alice Springs campus administrator Dianne Underwood congratulated the school for the exhibition. “It proves yet again the strong community spirit of Alice Springs in supporting events like these,” she said.